Once Barack Obama lays claim to the nomination, expect a flood of stories on how the Internet fueled his victory. The narrative already is taking shape. But the real story is likely to be more complicated. A big part of the Democratic electorate wanted to stop Hillary Clinton as much as anyone on the right. They coalesced around Obama in a way they couldn’t have coalesced around any of the other candidates that stood in her path a year ago. Most of these people already were/still are active online and set their sights on stopping Hillary (just like maker of the Vote Different ad suggested they should). The progressive wing of the Dem party never much cottoned to either Clinton. They’ve been more than happy, I imagine, to beat her. The Internet was simply their hammer. It’s ironic that Clinton’s Senate career has been spent girding for attacks from the right, but she fell to an unlikely attack from the center. At the risk of sounding like Geraldine Ferraro, I think Obama is probably the only candidate who could’ve stopped Clinton. John Edwards, Joe Biden, Chris Dodd, even Bill Richardson didn’t stand a chance. You can only trump a historic run with another historic run. It’s still up in the air whether the American electorate as a whole is in the same historical mood as the Democratic slice of it. I’d be more optimistic if I didn’t read regular letters to the editor of my local paper warning me about the socialistic left and the fraudulent hoax known as global warming. Lawyers for David Archuleta are filing a motion in federal court today to overturn the American Idol victory of David Cook, who was crowned victor in a stunning finale of the musical competition’s seventh season last night. Archuleta’s attorneys rest their case on the fact that Cook has failed to win over the crucial bloc of white girls aged 10 to 13, who make up a significant portion of the music-buying audience. Cook’s inability to dazzle this demographic threatens his ability to cook up a hit single this fall as a follow-up to his victory in the TV contest, the attorneys allege. Ing and his colleagues also contend that the finale should be redone as many tweens were asleep in bed during the crucial final phase of voting. Had these girls been able to vote, the results might have been different and Archuleta would have been the one weepily crooning at the end. Wait a sec. Are we talking about American Idol or the Democratic primary season? Who knows anymore. But it’s tempting to consider what Cook’s win portends for the second-biggest election this year. Is Cook a stand-in for Barack Obama, the outsider who wasn’t even expected to enter the contest? And is Archuleta Hillary Clinton, with a troublesome stage father in place of an intrusive stage husband? Or is Cook John McCain, the grizzled veteran, while Archuleta represents a new face, i.e. Obama, who was buoyed by a youth vote that failed to materialize when it really mattered? We can only wait and see. And hope that tween girls aren’t so disillusioned that they give up on American Idol entirely. If polls show that Barack Obama has trouble winning over working-class, less-educated whites, that’s science. But if Hillary Clinton mentions it, that’s playing the race card. I managed to convince myself at one point that the dragging Democratic primary wouldn’t be harmful. Now I’m not so sure, but don’t blame Clinton. As was pointed out last weekend, the Democratic party is an odd mishmash. Republicans are, too, I suppose. That’s what happens when you try to cram tens of millions of political views into two opposing camps. The continuing battle seems worse for Obama, in that it diminishes his ability to attract swing voters if he’s defined as the candidate of young people, African Americans and the college-educated (who, contrary to their own self-image, are a minority). Sure, Obama is popular online, the Web somehow predicted his victory and he has won more votes in the Democratic primaries. But anyone who thinks the Democratic primary process — or the Internet — is the best way to pick a general-election winner should think again. The Internet may simply be replicating the losing touch of the primary electorate itself. The chief talking point against McCain is that he represents a third Bush term. Given Bush’s poor standing, that line of attack makes sense. But I don’t see it sticking. It just doesn’t ring true, certainly not as true as Obama’s supposed elitism. That bowling score (37, but in seven frames. 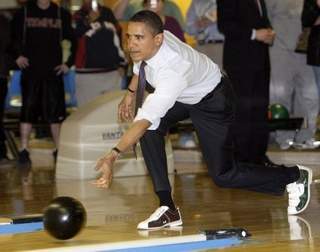 So be fair: he could have rolled a 127 if every other ball were a strike) — and this picture — is going to come back to haunt him. Couldn’t he at least have unbuttoned his collar and loosened the tie? He must have been pretty uncomfortable with all that fabric tugging at his neck. Plus, the far right will be contradicting the Dem’s attack on McCain’s behalf. Could it be the ultimate sucker punch? Conservatives hound McCain from the right knowing it will help him with independents and thereby paving his way to the White House? But let’s face it. Bush and McCain are very different men, have lived very different lives and have occasionally disagreed. Bush also won TWO TERMS. Let me go out on a limb and suggest that the polls showing low approval ratings have less to do with Bush and more to do with the way we expect people to perceive him, and the answers people believe they should be giving to the pollsters. It’s also a tidy way to sweep him off the stage so the cameras can focus on the sequel rather than the pressing issues facing this country. Who wouldn’t want to watch a beauty contest — however ugly it gets — rather than a food shortage or a housing crisis? The conventional wisdom suggests John McCain is the winner of the continuing fight between Barack Obama and Hillary Clinton. But is all this downtime really such a good thing? Sure McCain’ll be able to raise tons of money, but if money voted, Mitt Romney would be the GOP nominee and Obama would have swept Clinton offstage a long time ago. We hear a lot about Obama’s seeming inability to connect with the white working class. I wonder if McCain will have the same problem. I don’t think his primary victories really healed the rift over immigration and other issues between him and more conservative Republicans. Those disagreements have been lost in the media’s focus on the Obama-Clinton fight, but they’re likely to return, especially if a conservative third party mounts a challenge. The numbers from yesterday’s primary bear out the potential for an independent candidate to make inroads among disaffected Republicans (and perhaps among Democrats disaffected by whomever they ultimately choose). McCain got about 73 percent in Franklin County, but Huckabee got nearly 16 percent. Paul came in third with 11.2 percent. In short, more than one in four Republican voters in PA cast a ballot for someone other than McCain. Maybe they’ll close ranks in November and they were all just exercising their right to disagree. But if general-election unity is so in doubt for Democrats, why doesn’t the same question hang over Republicans? The answer may be different, but it’s still worth asking. If I were Barack Obama there’s one thing I’d be worried about from last night’s debate in Philadelphia. Yes, he deflected questions about Pastor Wright and “bitter-gate” with dexterity and he was relatively forthright in addressing them. Obama’s been fairly successful at insisting on a new kind of politics that doesn’t tar people with guilt by association. It’s an admirable stand and it’s been effective. But, to my mind (and I can’t be the only one who noticed), he seemed far less confident, and even appeared to stumble, in addressing questions about Iran. Now, I was assembling a child’s wagon while I watched the debate, so take this with a grain of salt. But Obama’s response to the Iran question caught my attention. He didn’t seem as forthright or as together in his answer as did Hillary Clinton. Sure, there were holes in her logic (we could barely get France under the security umbrella of NATO. How will we ever convince Iran and countries like it to do anything similar?). But she at least seemed to have a coherent, well-considered position. No one doubts John McCain will offer the same . I didn’t get the same impression from Obama from last night’s debate. Why does this even matter? Isn’t this election about the economy, about the war in Iraq, about change, blah blah blab? I guess. But unforeseen foreign-policy crises are often what define a presidency. Hardly anyone was discussing Iraq or terrorism in 2000 but they’ve dominated the last seven years and affected practically everything else we do. Iran might not present a crisis for the next president, but Obama’s stumble on it tells me he either isn’t thinking seriously about foreign policy or doesn’t have very good advisers on those issues. It’s one area where a short, largely domestic resume, might haunt him. Clinton supporters have put up three signs, all between Gettysburg and New Oxford. Obama is still at one sign. That puts her in the lead at 3-1 and suggests she may be the great closer that Ed Rendell has made her out to be. Maybe Obama’s supporters can’t let go of their guns or religion long enough to put up signs. UPDATE: This afternoon I saw a fourth Clinton sign, giving her a 4-1 edge. The fourth sign was on the east side of Abbottstown. If Barack Obama really wanted to make amends with PA voters, he’d promise a program to create renewable fuel from deer, sort of how all candidates pander to Iowans over ethanol. The program would naturally include an extended hunting season. But at the rate Hillary Clinton is pandering, she’s likely to jump the gun on this first. April 23 is going to be a real let-down. I’m not sure Pennsylvania is prepared for the post-primary. The main thing missing in the ongoing debate over Barack Obama’s comments about small-town PA are voices of actual Pennsylvanians (other than Ed Rendell). I’ve seen quotes from consultants, politicians and pollsters, but next to nothing from people who live in our small towns. So for your edification, here’s a particularly perceptive op-ed from a young reporter in York who’s a native. Athough it ran a few weeks ago, it shows why Obama wasn’t far off the mark. Yes, Obama’s comments were a tad condescending. How would it sound if John McCain said urbanites cling to their lattes and their fear of the suburbs because they’re bitter and frustrated that health insurance isn’t universal? Someone should just say that anyway, I suppose. But rather than discuss the issues affecting small towns in Pennsylvania, we’re going to get an argument about who’s an elitist. It seems Obama’s biggest crime was uttering words that anyone with the slightest interest in tearing him down could spin quickly and easily. If only politicians could move as quickly when they had an actual problem to solve. One of the underlying arguments in favor of Hillary Clinton is that she will be harder for the so-called “right-wing attack machine” to steamroll. But what if they threw an election and the attack machine stayed home? John McCain is unlikely to repeat or tolerate the tactics of Bush/Rove. First, he was a victim in 2000. Second, he seems genuinely not to care for that kind of politics. It might be a personal predilection, but it also might be the result of his Senate service. The US Senate is a clubby kind of place and I don’t see McCain relishing attacks against a fellow senator, be it Clinton or Barack Obama. Third, angry attacks risk having him look like a grumpy old man rather than a doting grandpa (putting the Wilford Brimley endorsement into context). Only the latter can peel away some of the youth vote. (Note also how the front-page story in yesterday’s New York TImes serves two purposes: McCain looks more sympathetic on the war, but he also looks younger — young enough to have a son in his early 20s). Of course, some on the right will be trying to tear down either Democratic candidate however they can. No one seems able to muzzle Ann Coulter. I just believe (or want to believe – perhaps it’s a utopian fantasy) that McCain will make stronger stands against that sort of thing than George W. Bush ever did. That might be one reason Rush Limbaugh is still queasy. Democrats shouldn’t try to fight the last war, especially since they lost. McCain just may kill them with kindness.